For an exegesis course in seminary, I was assigned R.T. France’s Mark in the New International Greek Testament Commentary (NIGTC) series. The assignment was to read the entire commentary that semester, and I read every one of its 700+ pages. It was that good. Like the rest of the NIGTC series, France’s volume focuses first on the Greek text, including textual variants where they arise. France is a careful interpreter and keeps the other synoptic gospels in view throughout the commentary. This is not, however, to the exclusion of a keen awareness of and sensitivity to the literary context of Mark as its own book. Even as he unpacks the lexical range of a Greek word, he keeps the larger contour of Mark in view. As I mentioned in another France review, despite the technical nature of Mark, France moved me deeply with his interaction with the text. He helped me to know and love Jesus more deeply, using the Greek text of Mark as a means to that end. You can find France’s commentary on Amazon (affiliate link) here. It’s in Logos here, where it is well-produced and thoroughly hyperlinked. I haven’t found a way to make the ads at lower left disappear. 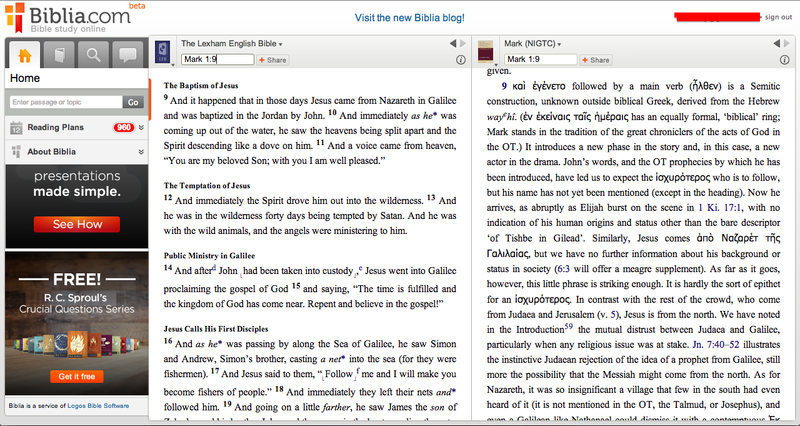 Nor is Biblia intended to be as full-bodied as Logos (note that it’s in Beta). Since you can access it through any Web browser, it’s fairly universally accessible. Only real downside I’ve experienced: unlike Logos on iOS, Mac, and PC, you can’t highlight or take notes in any resources. But for reading texts–two at a time, as shown above–it’s pretty handy. (ἐν ἐκείναις ταῖς ἡμέραις has an equally formal, ‘biblical’ ring; Mark stands in the tradition of the great chroniclers of the acts of God in the OT.) It introduces a new phase in the story and, in this case, a new actor in the drama. This is one of many examples of France’s using Greek to help the reader better understand what Mark is up to in his Gospel. His command of Greek and obvious love for God make this the first commentary to reach for when reading, teaching, or preaching on Mark. Thanks to Logos for the review copy of the NIGTC series. See also my post about NIGTC Matthew in Logos here.